Volunteer park host opportunities are currently available at this park. Beatton Provincial Park is a year-round recreational facility located on the shores of Charlie Lake. This 320 hectare park is a popular summer recreation destination for swimming, fishing and hiking. Beatton also offers excellent winter recreation opportunities. Experience over 15km of groomed cross-country ski trails designed for beginner, intermediate and advancing skiing. Visitors have a good chance of seeing deer or moose which frequent the park during the winter. A picnic shelter is available next to the day-use parking lot. A telephone is located on the main road just south of the toboggan run. Whiskey Jack Nordic Ski Club has completed the expanded trail network at Beatton Provincial Park. This new trail expansion now offers over 15 kilometres of groomed trails for beginner, intermediate and advanced skiers. Trail maps are posted at the trailhead and major junctions. Trails are marked. There has also been an addition of an extensive snowshoe trail designated for those other enthusiasts. As part of this trail expansion and site enhancement, Treaty 8 Tribal Association and BC Parks are also involved with developing First Nation interpretive signage to be situated along some of the routes. While this project is ongoing, these trails are now available for public use and enjoyment. Charlie Lake offers winter opportunities for the ice fishing enthusiast. This park is located 13 km northwest of Fort St. John off Highway #97 on the 244 road, approximately a 20 minute drive. Wildlife: Deer and moose frequent the park during the winter. Canoes and kayaks are welcome. No rentals located at the park. Cycling is allowed in the park. Bicycles must keep to roadways. There are cross-country ski trails that are available to mountain bikers in the summer months. Visitors can fish for walleye and northern pike. Anyone fishing or angling in British Columbia must have an appropriate licence. There are 12 km of hiking trails throughout the park. For your own safety and preservation of the park, obey posted signs and keep to designated trails. Shortcutting trails destroy plant life and soil structure. Pets/domestic animals must be on a leash at all times. Pets/domestic animals are not allowed in day-use/beach areas (with the exception of the designated dog beach) or park buildings. You are responsible for their behaviour and must dispose of their excrement. Backcountry areas are not suitable for dogs or other pets, due to wildlife issues and the potential for problems with bears. Check with park staff for directions to the designated dog beach, which is located between the main day-use area and the boat launch. Swimming beach and marked swimming area. There are NO LIFEGUARDS on duty at provincial parks. There are waterskiing opportunities on Charlie Lake. 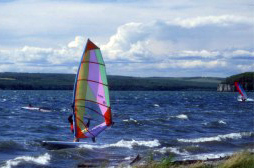 There are windsurfing opportunities on Charlie Lake. Beatton Provincial Park has excellent winter recreation opportunities. Cross Country Skiing – Experience over 15km of groomed cross-country ski trails designed for beginner, intermediate and advancing skiing. Trail maps are posted at the trailhead and major junctions. Trails are marked. Snowshoeing – an extensive snowshoe trail is designated. Tobogganing – a toboggan hill exists in the park. There is a double boat launch complete with turnaround and a large parking area for vehicles with trailers. There is a large day-use area with beach, picnic shelter, ball diamond, adventure playground and a large grassy area, with 100 parking spaces available. Group picnicking is available. There is an adventure playground located in the day-use area. This park offers vehicle accessible campsites. Campsite reservations are accepted and first-come, first-served sites are also available.